I'm thinking that this is going to go down as a good year. This could be the year that all my 2 year old projects get done. Already this fall I've finished this, and this, and this, and this. That's a lot of this-es. The thinner slice of wood came from a neighborhood tree that blew over in a storm. 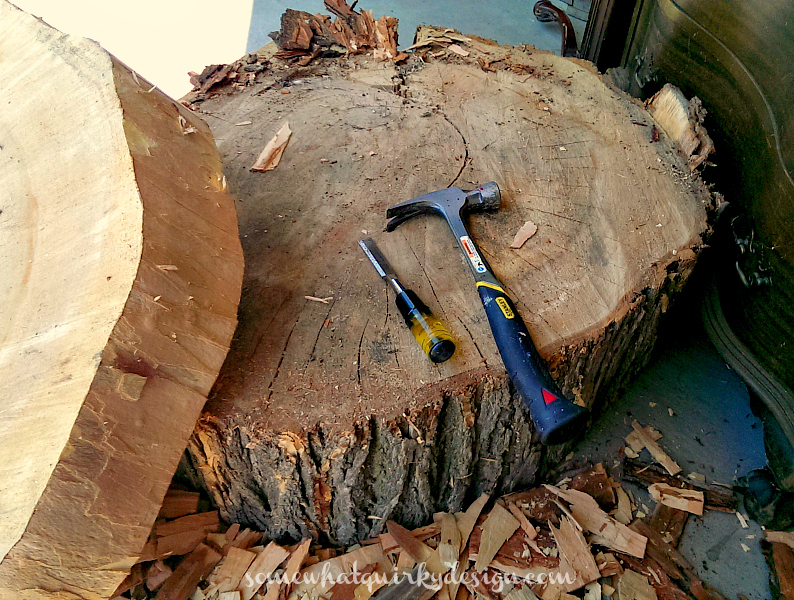 When the tree guys came to saw it into pieces, I bribed them into cutting me this slice as well as the smaller slices I used in my garden way back when. 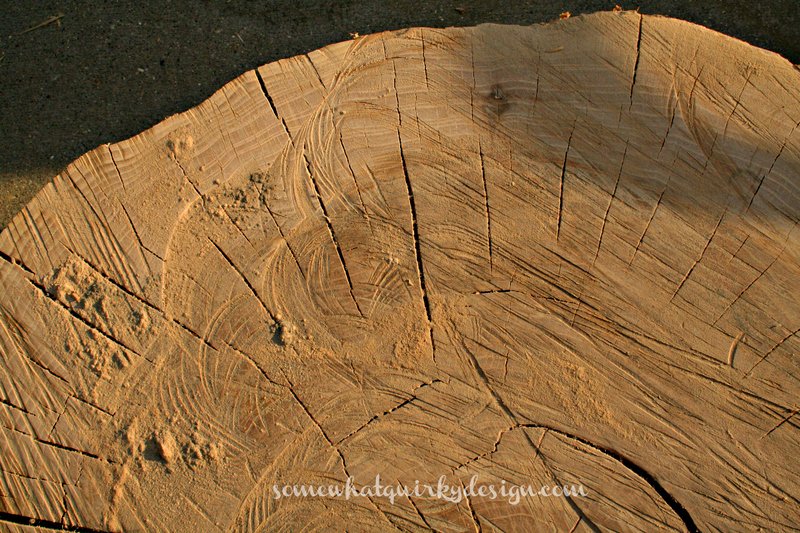 The larger piece was one of the last pieces left from a tree that was chopped down in a nearby park. I think it was still there because it was incredibly heavy. I dragged Mr. Quirky out to go pick it up. We opened up the back of the SUV and squatted down to pick it up . . . and nothing happened. Nothing, except that strain you feel in your chest when you try to lift your car. We had to go pick up another friend to come and help us. We brought it home and rolled it into the garage to dry out. After about a year of drying I got out my chisel and hammer and started knocking off the bark. Some people use a grinder for this. I removed everything that was bark colored - which was really about an inch all the way around. It took a while to do this with a chisel but it wasn't too long. I did it all in one sitting of maybe a couple of hours. Then let them sit for - oh, maybe 6 months or so. During that 6 months or so they both cracked. I will say here that I don't have the scientific answer to why the wood cracked. I do wonder if there is a connection between removing the bark and splitting. But I do not know. I sanded with a belt sander and with an orbital sander. I sanded with 60 grit. I sanded until I could no longer sand. I sanded on the top. I sanded on the sides. I did NOT sand the bottoms. Or at least not too much. Then I sanded with 220 grit. That went a little faster. 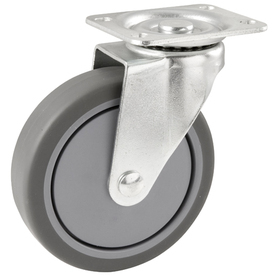 Then I went to Lowes and bought these casters. I wanted rubber casters so they wouldn't scratch the floor if there wasn't a rug underneath. But man, they looked completely unlike I wanted them to look. So I wrapped the outside of the wheel (the part that actually rolls on the floor) with painters tape and sprayed them all with Rustoleum's Oil Rubbed Bronze Enamel. They look quite a bit better, don't you think? 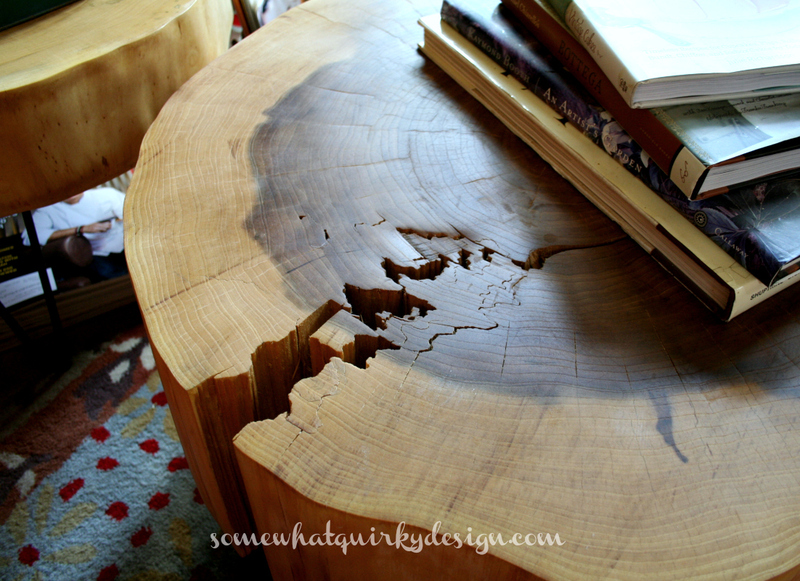 I screwed them on the un-sanded side of the table and a table was born! If you look closely you can see that I had to shim one of the wheels to help balance the table. Then I went to the basement and found the hairpin legs that I bought from an estate sale just to put on the thinner table top. The thinner table is covered with 3 layers of hemp oil and then about 8 coats of Homer Formby's Tongue Oil Finish. The thicker table has been treated with about 3/4 of a bottle of hemp oil. It's weird how the wood is so irregular in color - especially on the sides. I'm getting used to the flaws. I especially love the cracks. 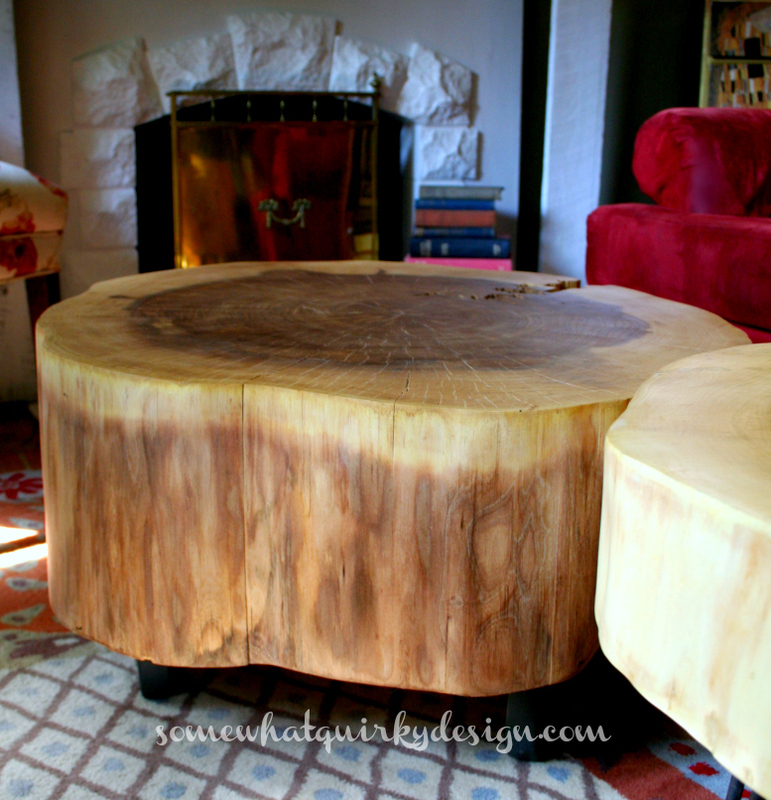 If you came here to find out how to make a wood stump table stay tuned for a short version of the instructions. If not just skip down to the comments and tell me how wonderful my tables are. I need to hear that - after all that sanding. A product to finish and protect the wood - you pick your favorite, I prefer the finish I got with just the hemp oil. Let the wood dry out for a few weeks. You may actually get a puddle underneath the wood. Finish and protect the wood with the product you chose. Really pretty Karen! Your hard work sure paid off! Love that you put wheels on the one and especially love that you spay painted the wheels. karen, they are perfect. i love the imperfections in them. You are way more determined than me. I have a stump in my yard that someone dropped off for me and I am still trying to figure out how to get it to the back yard. Karen- Those turned out great. My father-in-law had one made out of a slice of Rosewood and it was gorgeous. He paid a fortune for it...and it burned when his house burned down. My goodness... these are so amazing! I've featured them on my Facebook page tonight. :) Thanks for linking them up at Party Junk! Wonderful job with the sanding! What kind of trees are the slabs from? I would assume that some types of wood would be better for this project than others and also determine how much cracking happens. So impressive!!! I love, love, love them! Really, really love!!!! 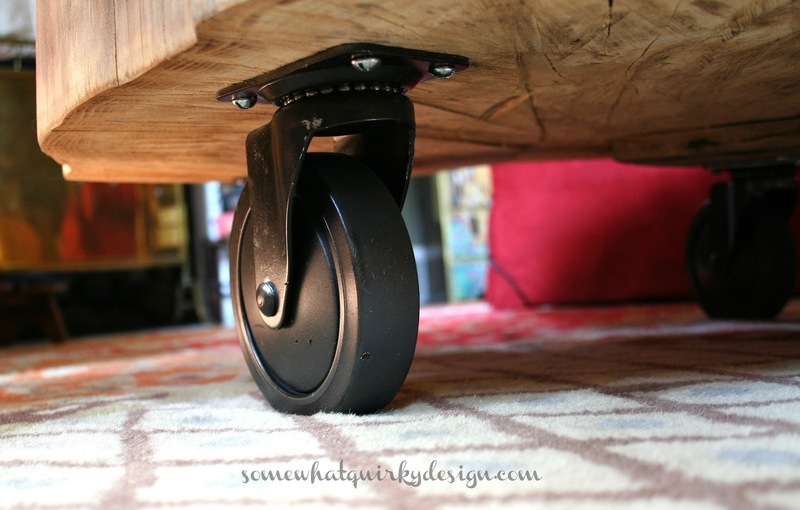 I do buy those casters from Lowe's, but time I get home I paint them rusty colors so when I need them they are ready. 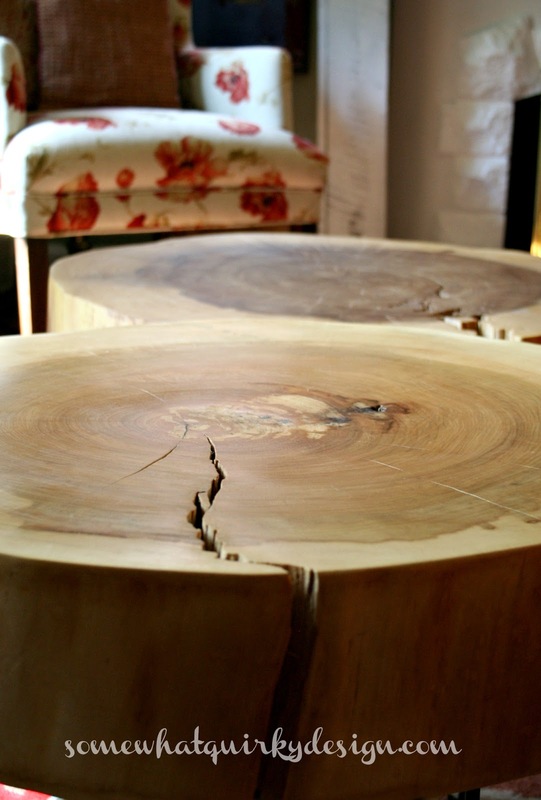 I LOVE these tree slices. The cracks give them character and the coloration is beautiful. 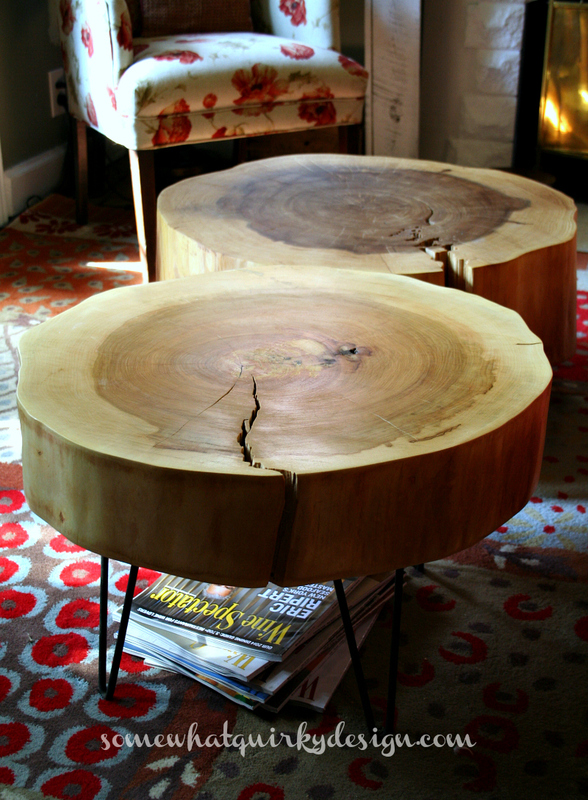 the tree tables belong in a design magazine. 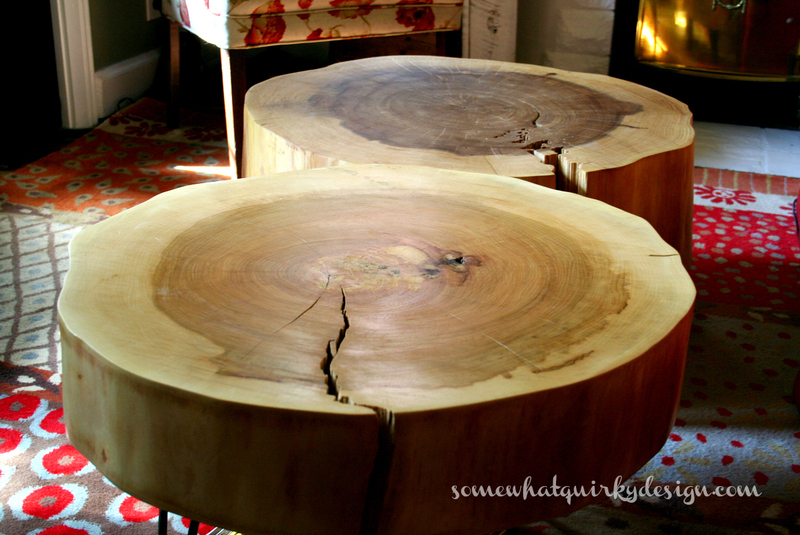 The coffee tables are awesome, wow, you are so talented! I love them! Enjoy your weekend. Came from before and after Wed. I'm speechless at how truly wonderful those tables are!!! Wowza! That is some crazy complicated and time consuming project! Wow, they are gorgeous. Definitely worth all the hard work. I've been wanting to do a project like this for a while. You are Brilliant and the tables are Gorgeous. I wish I had seen this last week when our neighbors were having a tree cut down . I would have bribed the tree company for a slice or two. 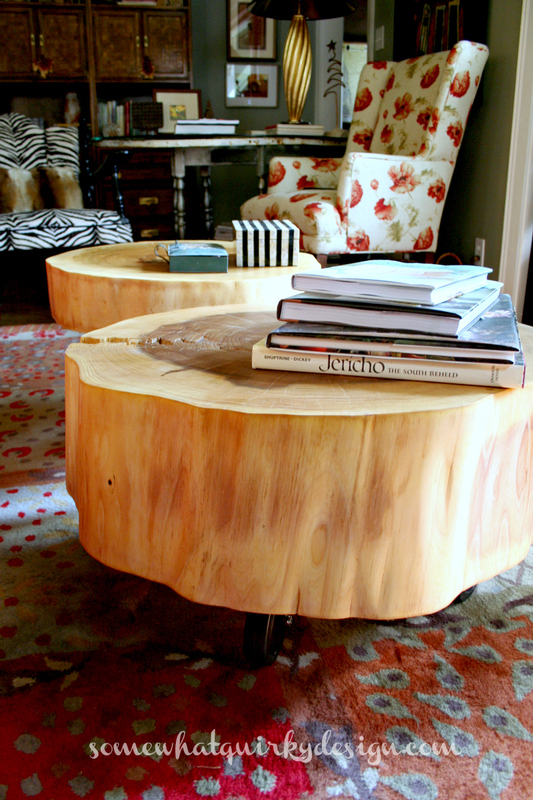 Those tree stumps are gorgeous as coffee tables. I have a few trees that need to come down. 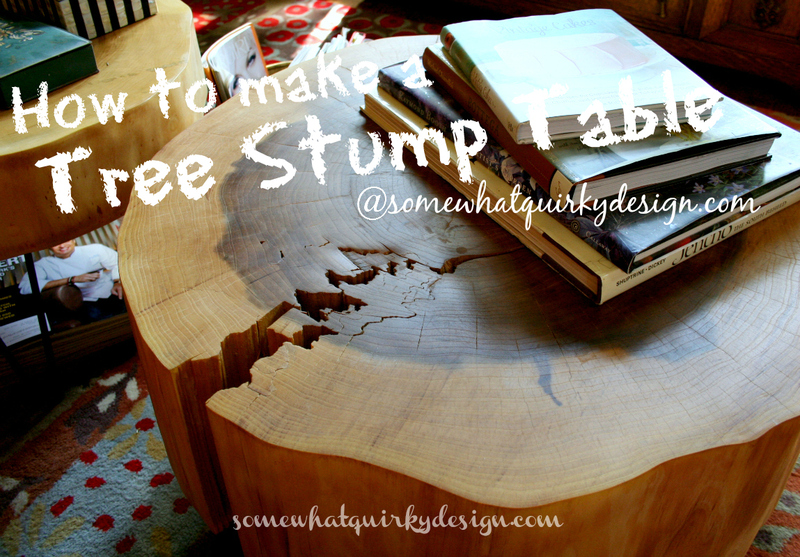 Recently, I had been wondering what I would do with the stumps that would be left over. 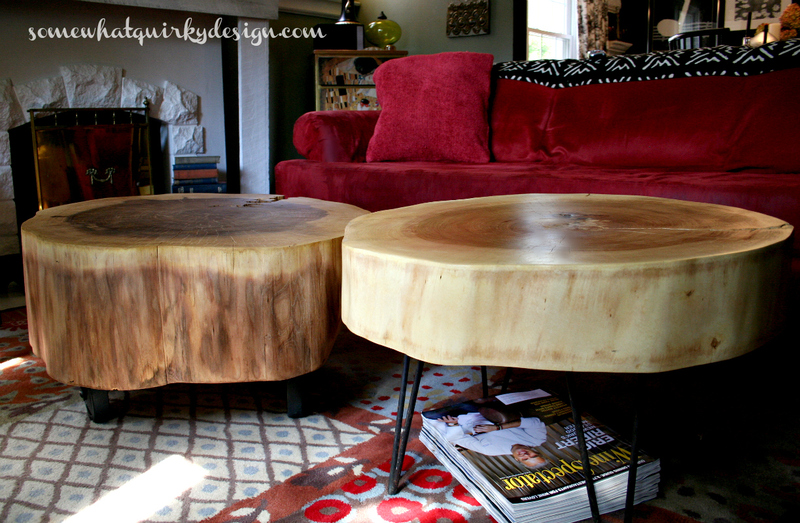 These coffee tables are a great way to use as much of the tree as I can. wow! very nice post. I have read your post. I like this tree cutting & nice designing. Awesome post. Most informative. Thx! , Super! Thanks especially for the pic! Impressive! Cannot wait for the next idea. Given a free hand, no telling what your young man will create! The law of diminishing returns is at work here – new technology equates to startling new creations – old technology equates to few new creations. I'd have to admit that I admire your effort and patience to make these round tables. I also love DIY stuffs, but I don't have much time for my hobby. Anyway, these tables look very natural.